Well, nature has already begun rejecting the idea of Donald Trump as a serious presidential candidate, as evidenced by what’s been happening in western Canada the last several days. A wildfire that began earlier this month is raging through northeastern Alberta, forcing some 100,000 people to evacuate. A drier-than-normal season with little snow has contributed to the surging flames, of which many people attribute to the effects of climate change. As many as 1,600 homes have been destroyed. Tens of thousands of Canadians unfortunately got a dose of one of everybody’s favorite hypothetical ultimatums — if your house was about to burn down, what would you rescue? If you answered your cat and your Harry Potter books, and you’re female, then please send me an email so we can meet. But it’s the biggest evacuation in the petroleum-rich province’s history. And in a sinister twist of fate, among those refugees are families who recently were resettled from war-torn Syria. Imagine waiting years to finally leave one calamitous situation, only to be settled in a place that months later becomes inhabitable. And you all thought you had bad luck? 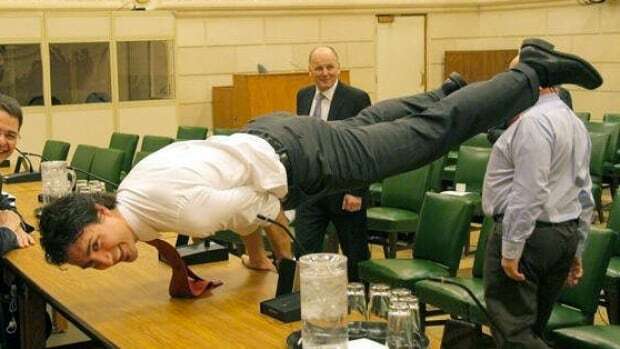 It’s the country’s biggest disaster yet under the fledgling leadership of Prime Minister Justin Trudeau, who, until now, was best known for doing yoga in his office and posing with adorable animals. But even I’ll admit, as a heterosexual male, he looks pretty damn good doing it (#datwavyhairdoe). In all seriousness, this whole thing is pretty terrifying. The pictures are shocking. People’s lives are now in shambles. And I’m convinced that this is nature’s way of punishing us for voting for Donald Trump. The timing is too impeccable to think otherwise. So on behalf of America, allow me to apologize to Canadians. I’m sorry. I didn’t vote for the man, and I’m trying to use what little voice I possess to encourage people to follow my lead, but I still feel at least partially responsible as a resident of this nation. I’d ask what’s next in Mother Nature’s onslaught against us, but I literally just read right now that tornadoes are ravaging Okalahoma. This is real. We should all be fearful every day until Donald Trump is disposed of. We have unearthed some unnatural force that is now wreaking havoc upon us. Everyone thought our demise would be nuclear war. Or disease. Turns out it was Donald Trump. On a brighter note (literally! Haha, get it? Oh wait, I haven’t gotten to the punch line yet…. hold on) Mercury made its rare transit across the sun today (get the joke now? “Brighter?” You see? ), making it visible from Earth, which is something that only happens 13 times a century. And it made for a lot of pretty pictures. Given the political landscape, I half expected Mercury to veer off course and be sucked into the giant fireball we know as the sun, but thankfully, that did not happen. Fortunately, the consequences of our actions have not extended beyond our planet. I’m looking at you, Neptune. If any planet is going down, it’s you. You never had a chance.